On our first episode we talk about what a coach is and why getting one might be just what you need to to actually achieve your golfing goals. Our current model of golf instruction is scheduling a one hour lesson and letting that instructor know what you want to work… but coach Will talks about why that just doesn’t work if you want lower scores. We’ve all heard that golf is a “mental game” and all in the head. But what does that really mean and how do we change it? Coach Will talks about why golf is an emotional game and how what we BELIEVE creates those emotions, not what we’re thinking. You’ve gotten into allthe technicalities on the golf swing and spent years trying to understand it, take just a few minutes to listen in and change your beliefs and ultimately results. American culture pushes us to be great; to work harder, have high expectations, and in our golf games, always expect to play great golf. We dive into the stats and realities of what it takes to play great golf. Too many of us bring in unrealistically high expectations that we simply can’t meet. Also in this episode, learn the most important stats to understand in this episode. You don’t have a technique problem, but you keep searching for answers based on your technique. When Rory shot 40 on the back 9 at the Masters and lost the tournament, he didn’t lose his technique. His golf swing didn’t suddenly change… So what was it then? Want more coaching and the exact system you need to shoot lower scores? Sick of just one or two good rounds of golf a year? The Scoring Method is simply a new way to look at the game of golf with the skills and swing you have today. You’ll learn how get the ball in the hole quicker and the expectations and concrete strategies you need. We’re talking less frustration and no more blow up rounds. 30+ videos walking you through everything you need to know to succeed with the scoring method. 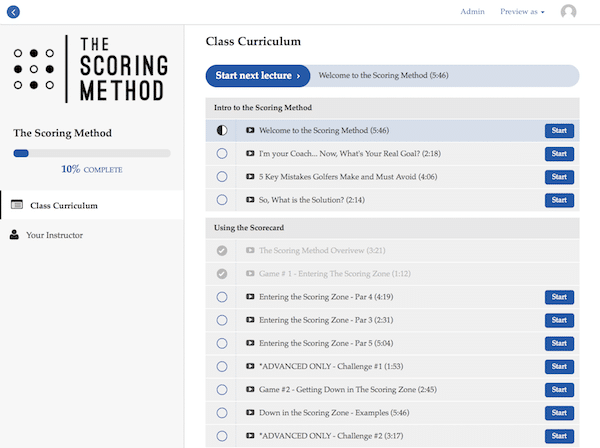 Access to the Scoring Method community and additional coaching from Will. I was out working with a new golfer the other morning. He’d played golf for 18 years. Got out about once a month but never really progressed. He just wanted to break 90 consistently, so he wouldn’t get so frustrated on the course (and let’s be honest… feel a little more confident around his friends). When we teed it up on the first tee he started rattling off issues with his golf swing and how he couldn’t hit his driver and what he was working on in his swing. It always seems like every golfer does that when they get around a golf instructor. And my question is always… How is that going to help you shoot a lower score today? It’s not. Reframing the way you approach the game and understanding what the REAL game of golf actually is you can start to systematically lower scores. Walk you through the mindsets you need to start shooting lower scores. Share with you our Scoring Method Scorecard and how to use it. What to do once you use the Scoring Method and get your results from the scorecard. How do I go through this coaching? We have all the video coaching in an online learning system which you get instant access to as soon as you sign up. Inside that portal you’ll also be able to download any resources and documents you’ll need. If you have questions we’ll be here to help! You get lifetime access to this content in our course portal! We’ve had hundreds of people make it through the program. In this program we’re going to walk you through a specific strategy to lower your scores and change your expectations with playing golf and shooting lower scores. Coach Will Robins has spent the past 8 years honing and refining this system with thousands of students dropping thousands of shots off their score. We’ve made this a price of a normal golf lesson in the US. We’re confident you’ll get far more value than what you’re paying. Is this relevant for a single digit handicapper? “I’m new to this group also – a 5 handicapper here in Australia. I was excited until I got into the program and saw Will talking about hitting two 7 irons and 9 irons off tees. He’d lost me at that point but I persevered. So I decided to bring the Scoring Method to the course and embrace it….First reaction is more than a big a-ha! Firstly, I shot level par for 9 holes (3 pars,3 bogeys with actually 3 birdies in first 5 holes). Secondly, I didn’t complain, like I normally do, when I hit poor tee shots on 3rd,8th and 9th. Instead,my mindset was ‘Can I get into the Scoring Zone?’ I actually was in it on 8th and 9th after one shot anyhow. Thirdly,it reduced my swing thoughts. I’m very guilty of having a million swing thoughts. In the Scoring Zone,my only thought was ‘complete the follow through’ as per Will’s Pitching Pressure Free video. Took one practice swing each time and then stepped up and hit great pitches into 1,2,3,4,5 and 6. If you’re frustrated with golf and are more p*ssed off than happy after playing. You need this to understand how scoring works and that’s what we’ll teach you. If you’re trying to break 90 every round this is for you. If you want to learn how to erase all blow up holes this is for you. If you want to get a plan to create smarter and PURPOSEFUL practice based on how you actually play golf. We’ll show you that. I’ve used the scoring method 3 time on 9 holes and found it takes a lot of pressure off since my driver usually gets me in trouble. I find it easy to get within 100 yards in regulation then I usually get down in 3. Par 5 are still par-able which surprised me. What I am most excited about is how my scoring dictates how I practice. This method has changed my game forever and I look forward to getting to the next levels in a methodical manner. ​ I came to the program a month ago and was shooting in the mid to high 90s and yesterday I shot an 81. The most helpful thing was learning how to break the game down into two parts. Entering the Scoring Zone and getting Down in the Scoring Zone.